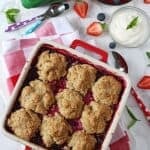 A delicious and fresh dairy free cobbler dessert recipe made with summer berries and peaches and Flora Dairy Free Walnut. Add the frozen berries and peach quarters to an oven dish. If the strawberries are quite large you might want to cut them in half. Add the peach juice, walnuts and orange juice and then sprinkle on the caster sugar. Mix well. Add the flour to a large bowl. Remove the Flora Freedom Walnut from the fridge and cut into 6 or 8 squares in the tub then add to the bowl. Using your fingertips, rub the butter into the flour. It’s fine to still have some lumps. Add the oats, sugar and cinnamon and mix with a spoon. Form the mixture into approximately 9 clumps and place on top of the fruit in the oven dish. Bake for 35-40 minutes until the cobbler is golden brown on top. Allow to cool a little and serve with creme fraiche.